The wait is over. 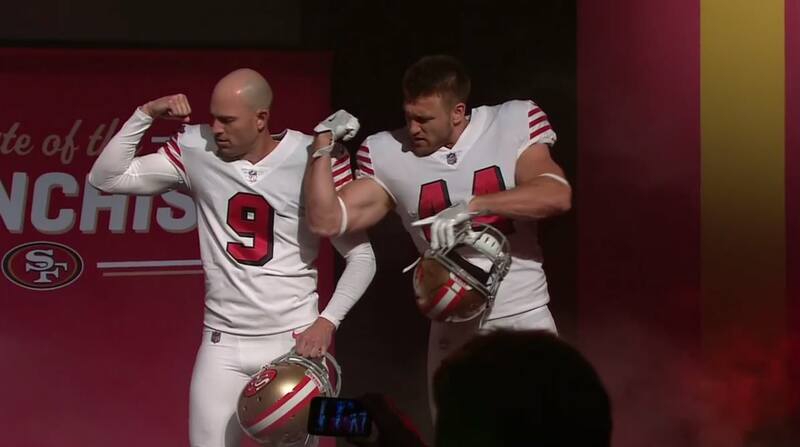 After successfully avoiding leaks, the San Francisco 49ers have unveiled a new alternate uniform from the upcoming season. It is inspired by their ever popular 1994 uniforms which they wore during their last Super Bowl title season. Those specific uniforms were a throwback to their 1955 set. These uniforms are not exactly 100 percent accurate to those uniforms as it will feature white socks (to go with the no longer mandated Color Rush initiative). But apparently the players can opt to wear red socks if they please. Everything else remains the same, although with the way jerseys are cut these days, the sleeve stripes are moved up significantly. There are no TV numbers and the team will wear the same helmets they wore in 1994. 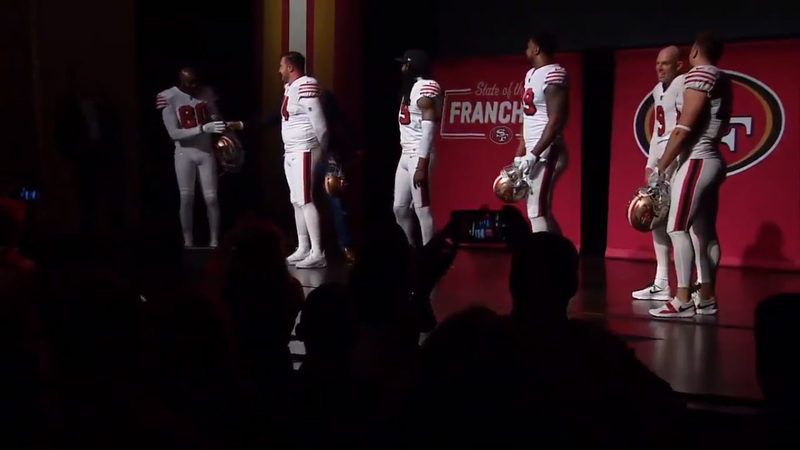 The addition of white pants is a welcomed look that some 49ers fans have clamored for. It’s a look that the team has not worn since the 1997 season. Now they have the all-white look from 1994 back in their rotation. Well, to be fair, we can’t expect the NFL to be the voice of the masses, can we? So this is the new rule that is supposedly a good compromise from the NFL. You either stand for the anthem or be in the locker room if you don’t want to stand. It’s easier this way as the NFL will hide away all those players who they deem controversial. Or just try to help remind us that Colin Kaepernick was screwed out of a job just for this very reason. The anthem hasn’t always been played before games. It has only become such a big deal, especially in the NFL, in trying to put this image that the sport cares about their military. I don’t deny that there is a lot of respect for the armed forces and that the league loves America, but it’s hard to fathom how much of this new rule is about that or is it to uphold a certain image. So here we are. A rule set in place to silence those who don’t even speak during the anthem. A move that will indeed cause a lot more problems. Teammates will have issues with one another on who is staying and who is going out. 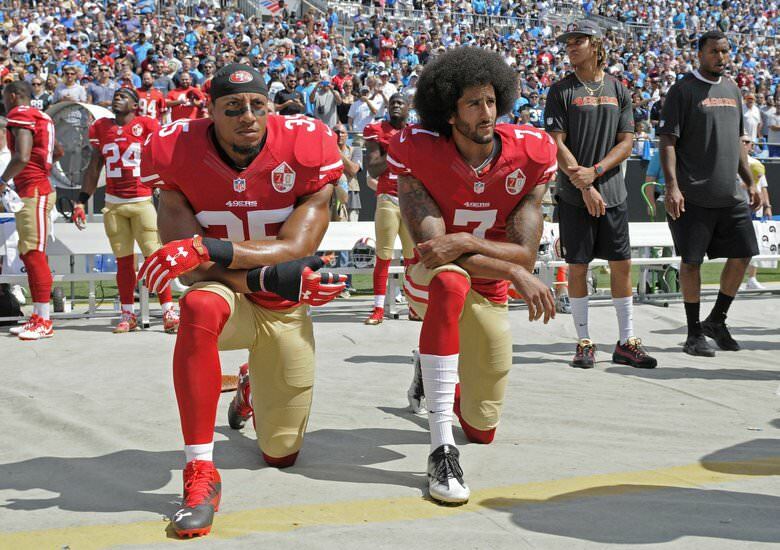 There will be some rogue players who will take a knee on the sidelines regardless. They’ll fight the fine and the NFL will endure more trouble. The whole point of protesting is to be seen, not to hide away. Brushing away the protests into the locker room isn’t going to make things better. It’s only a small fix that will eventually fade away and another discussion will begin. With the NFL already suffering from fans questioning the owners’ integrity on this issue, expect more of the same going forward. It’s a bigger issue than just sending players away to the locker room just so they can’t be seen. This new ruling solves no problems. It will just invite more.